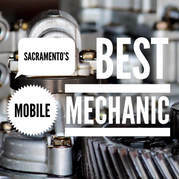 If you are in need of a mechanic or a car repair service in Carmichael, CA, then Carmichael Mobile Auto Repair is always here to help you at any time. We are focused on providing outstanding customer service and can even provide you with a complimentary inspection of your vehicle. If we find something that we feel should be repaired, we will carefully discuss it with you so you are able to make a well-informed decision on your vehicle. Carmichael Mobile Auto Repair, in Carmichael, CA is the auto service experts to remember. If you call us we'll treat your vehicle like our own by keeping it at peak performance at all times. It all starts with a routine service schedule designed by our ASE Certified Techs. Carmichael Mobile Auto Repair provides repair and maintenance services that you can trust no matter wherever you are in Carmichael, CA. We service all makes and models, specializing in European and Asian imports. Trust our mechanic to take better care of your vehicle than you would. Your safe, reliable, and comfortable road travel is our top priority. Our clean and consistent oil and filter change schedules will keep your engine running smoother and longer. So, no need to look further. If you are in Carmichael, CA and need help to troubleshoot your vehicle then simple call us at Carmichael Mobile Mechanic : 916-306-5254​. Will be right there on time.